GEHWOL FUSSKRAFT Soft Feet Cream’s gently caring base contains vitamin-rich avocado oil and other valuable lipids. 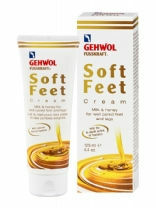 GEHWOL FUSSKRAFT Soft Feet Scrub gently and thoroughly removes dead skin cells, renews the skin surface and smoothes it. Natural bamboo granulate and jojoba wax encourage a gentle massage and activate skin circulation. 125ml & 500ml. Almond & vanilla for well cared legs and feet. Soft Feet Nourishing Bath spoils the feet and legs with an unforgettable bath experience – for beautiful, supple skin. Dermatologically tested. Also highly suitable for diabetics. Also suitable as a shower or full bath. Water lily & silk for well cared legs and feet. 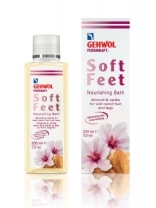 GEHWOL FUSSKRAFT Soft Feet Lotion refreshes and nourishes with select active substances. The new GEHWOL FUSSKRAFT Soft Feet Scrub is can immediately turn the foot bath into a regenerating, caring spa experience. 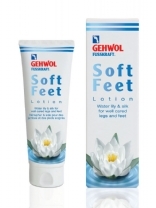 Use the Gehwol Soft Feet Cream with Milk and Honeycream to spoil your customers with an aromatic foot massage after the treatment.